The Cape Charles Museum and Welcome Center opens a new exhibition on May 12th. “Building a Community: The Cape Charles Elementary (Rosenwald) School” tells the story of the extraordinary working collaboration between educator Booker T. Washington, philanthropist Julius Rosenwald, and African American communities across the rural south during the period of legal segregation, a movement which enabled the opening of the Cape Charles Elementary School in 1929. The remarkable education, values, and community spirit of that school are told through the original voices of former Cape Charles Elementary students and teachers. In May of 1928, the town of Cape Charles purchased 2.5 acres from the Pennsylvania Railroad to build a new Rosenwald Fund school for local black children. The lot was located about a quarter mile outside of town on the west side of Route 642, “over the hump”, the hump being the elevated road and walkway over the railroad tracks. 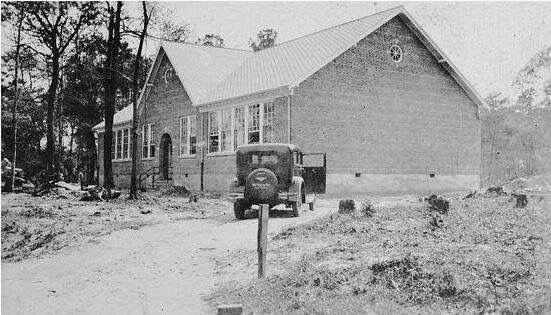 The African American children of Cape Charles were moved into the Cape Charles Elementary School in 1929. Being an elementary school, only grades 1-7 were taught. Black children were bussed out of Cape Charles to segregated county high schools for 8-12 grade. The school was closed in December of 1966 when Northampton County schools were consolidated, four years before they were integrated. Although they remained in segregated classrooms, the students were moved to the Cape Charles High School during the 1965-66 school year, making Cape Charles one of the first school districts on Virginia’s Eastern Shore to technically integrate. Like the underlying values of the Rosenwald School project, this exhibition represents a collaborative community effort. The Cape Charles Historical Society partnered with the Cape Charles Rosenwald School Restoration Initiative (CCRSRI), the Cape Charles Northampton Heritage group, and members of our local and regional community to tell this important story. The exhibition has been funded in part by Virginia Humanities. The exhibition can be viewed at the Cape Charles Museum starting May 12 and kicks off with a screening of the Aviva Kempner documentary “Rosenwald: The Remarkable Story of a Jewish Partnership with African American Communities” at the historic Palace Theatre on Saturday, May 12th at 1pm. DVDs of the documentary will be available for purchase. The Museum is open during the week from 10 – 2 (until 6 on Tuesdays), Saturday 10 – 5, and Sunday 1 – 5. Admission is free; donations welcome.